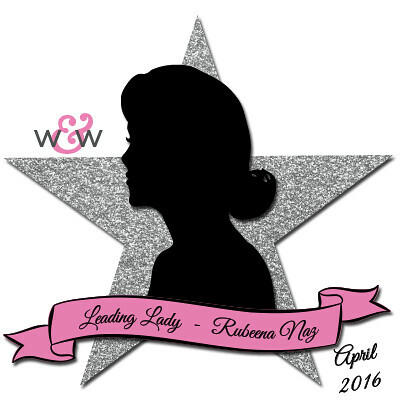 Our April Leading Lady, Rubeena Naz, is back for her sensational second performance! If you missed her smashing debut you must see it...CLICK HERE. Ruby delivers bright and bold color today with her array of brilliant cards! Good morning! I am back with my second post as Leading Lady for Winnie & Walter! Thanks so much for all your comments on my last post. If you missed it, you can find it here. In my debut post, I talked about how color can inspire projects. Before I start a project, I tend to think about what colors I will use. That helps me to decide whether the color will be added by a medium (markers, color pencils, watercolors, etc) or paper (color card stock or pattern paper). Lately, I have been having fun with watercolors so today's post will focus on that. If you are new to watercolors or do not have a lot of practice with them, my post is for you! 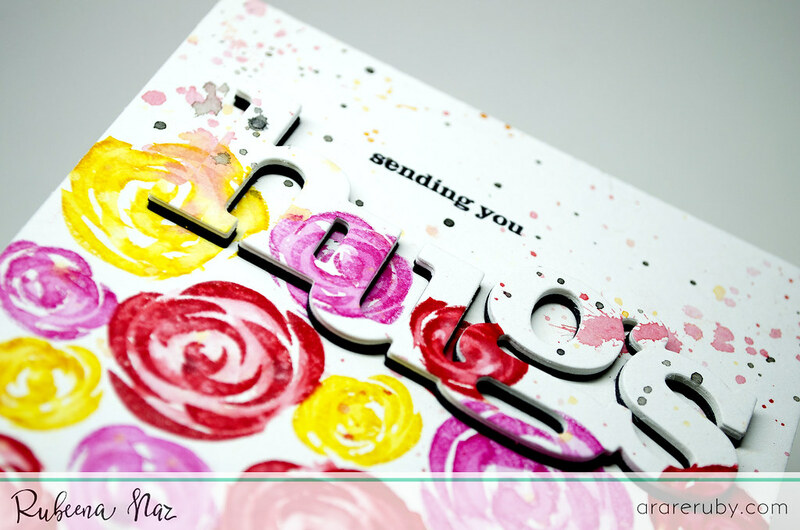 I show you different ways you can use your watercolors with stamps and how to make beautiful, bold cards. For the first card, I used In Bloom: Lola's Bouquet with Joni Andaya. This set is very versatile and includes both solid and outline images for many different looks and techniques. 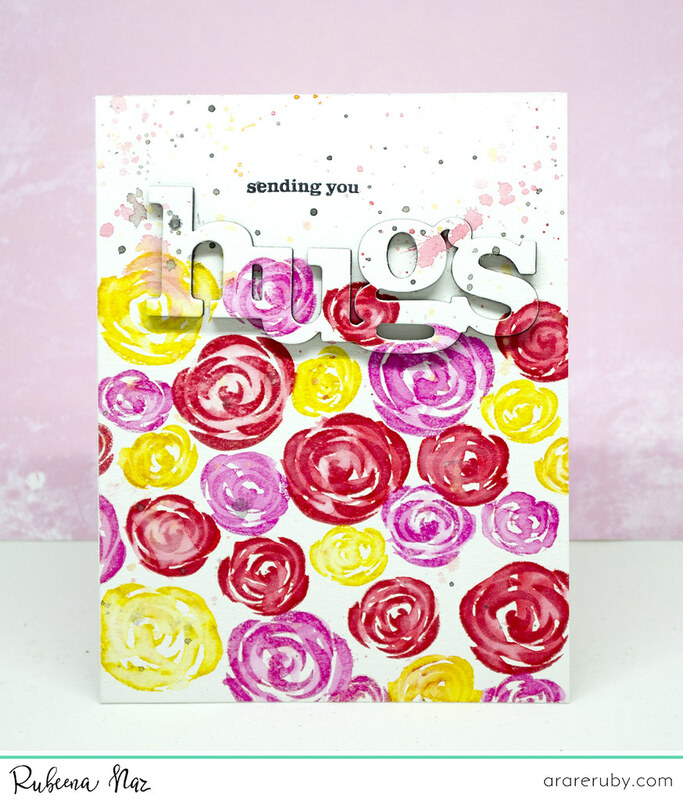 I used the expressive floral stamps with Distress Inks to create a colorful background. The great thing about using Distress Inks is that it reacts to water even after it has dried. I stamped the three different size flowers in yellow, pink and red. I used a size 2 watercolor brush to spread the color around and finished it off with some splatters. One fun way to add sentiments is using word dies. I die-cut the word 'hugs' from the colored panel using In a Word: Hugs Cutaway. I die-cut the word in black and white card stock twice each and then glued them all together with glossy accents for dimension. The black card stock adds a bit of contrast to the colored piece. Finally, I stamped the sentiment 'sending you' from LS Exclusives: So Tweet with Evelin T Designs. 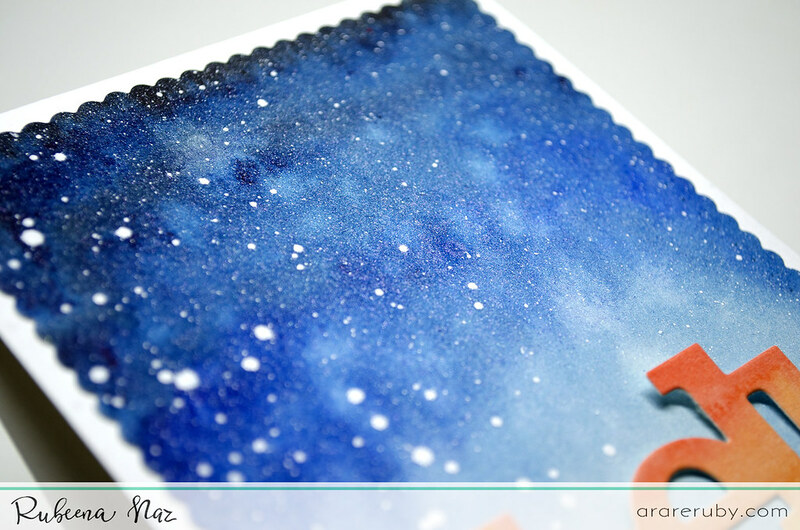 You can take various shape or image stamps and create your own watercolor background in a similar fashion. Playing around with different color combinations or even neutrals will give you different looks. The sentiment can be stamped with a darker ink or heat embossed over the background. For the second card, I stamped several images from In Bloom: Addie's Garden in black waterproof ink and using masking tape. I created a sort of garden border. I colored them with a size 0 watercolor brush and allowed it to dry. I fussy cut around it and then arranged it over a black card base. 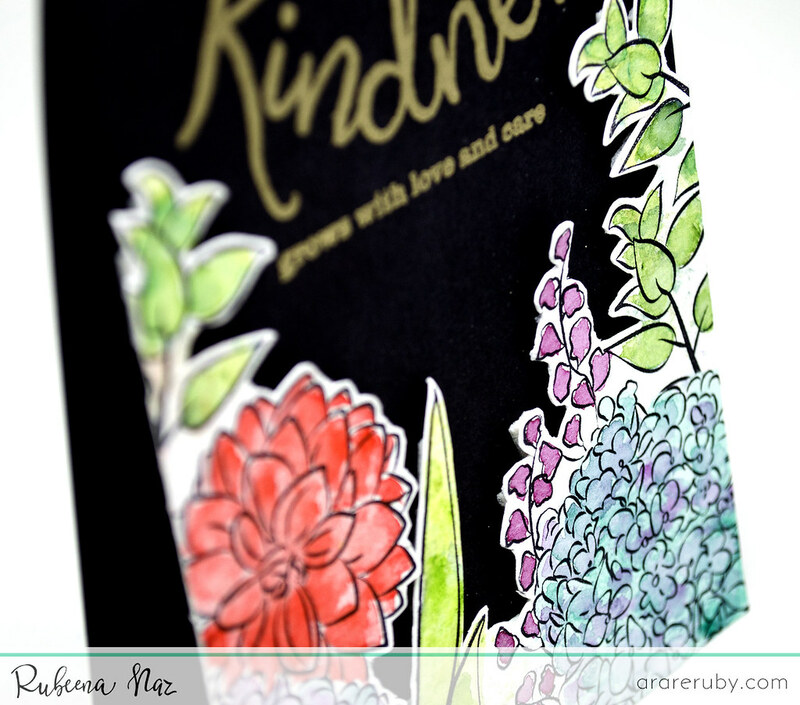 With the help of my MISTI, I was able to see where I would stamp my sentiment from Kindness with Evelin T Designs. Once I knew where I was going to stamp it, I set the image aside (since I haven't added any adhesive yet) and prepared my base with powder tool to prevent stray embossing powder. I stamped the sentiments with VersaMark and heat set with gold embossing powder. Then I added foam tape behind the garden border and matted it down on my card base. If you can't tell, I really love using black with color for a superb contrast! When I stamp images from a set, I like to stamp a lot of them. This helps me to create multiple cards or save pieces for later projects. 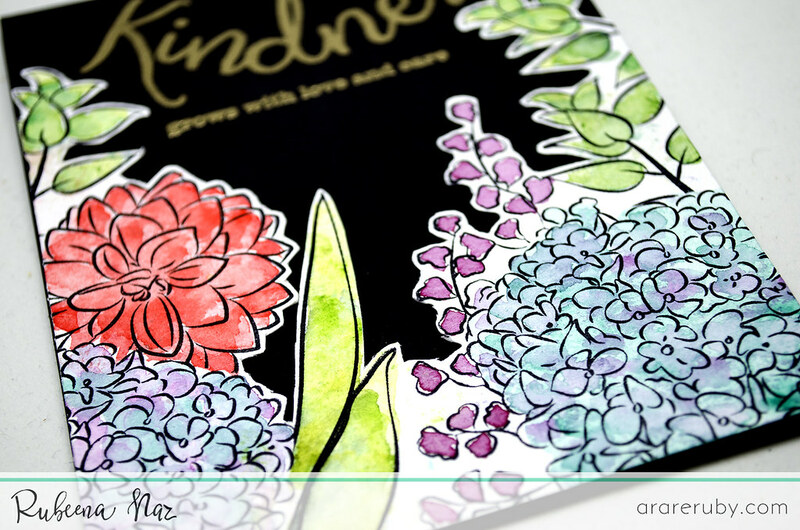 Since I had stamped extras, I created two more cards using In Bloom: Addie's Garden. 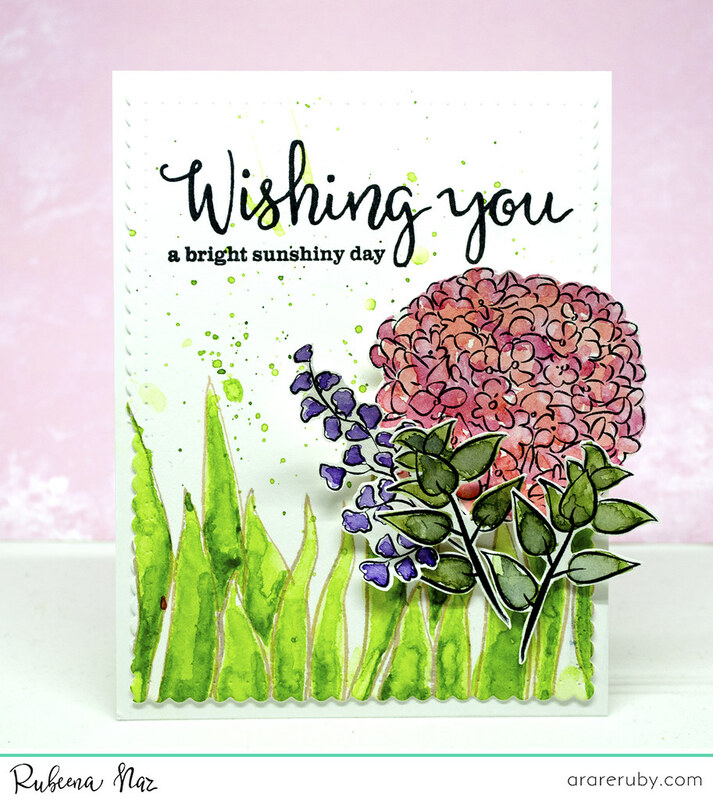 For the next card, I prepared the background by stamping the stems with a light ink and colored with watercolors. I die-cut with the larger scallop border from Essentials: Audrey Cutaways. I stamped the sentiment from Wishing You with Evelin T Designs using black ink and my MISTI (for a crisp look) and then arranged some of the images I had colored and fussy cut over the grassy background. Finally, I matted it down over my white card base. For the other one, I left it one-layered and stamped the sentiment from My Precious. 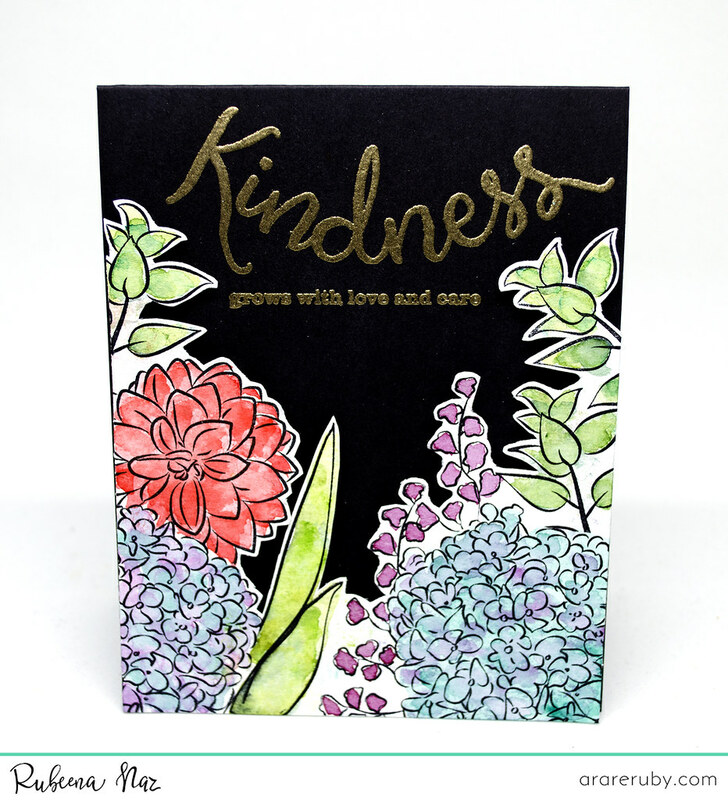 I used one of the linear stamps from In Bloom: Lola's Bouquet with Joni Andaya to create a striped border on my card base and added a strip of gold glitter card stock and black scallop border. If you're still reading, then you must be a big fan! ;) My last two cards feature watercolored backgrounds. I colored a background using various blue and blue-green watercolors. Once it dried, I die-cut it with the larger scallop border from Essentials: Audrey Cutaways. 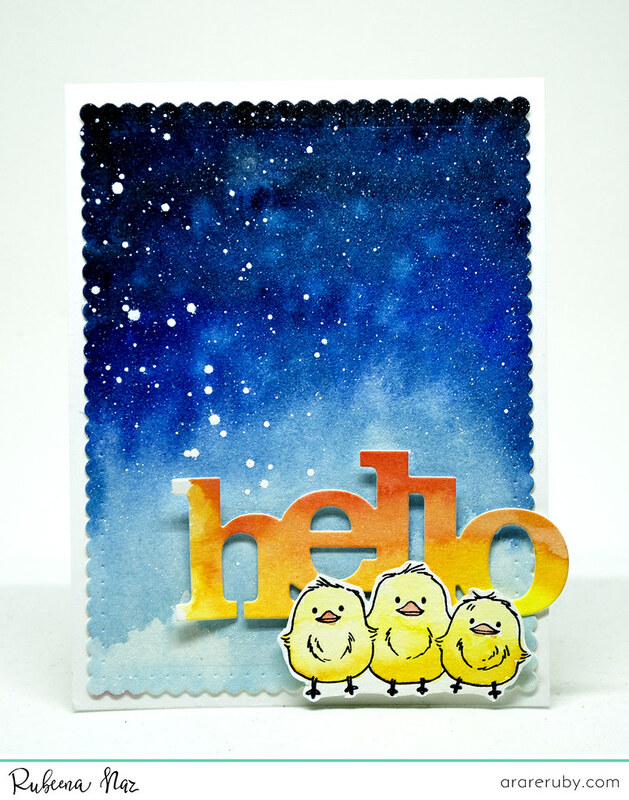 I stamped the birds from LS Exclusives: So Tweet with Evelin T Designs, colored with the same watercolors and fussy cut them. Aren't they so adorable?! And finally, my last card uses My Precious. 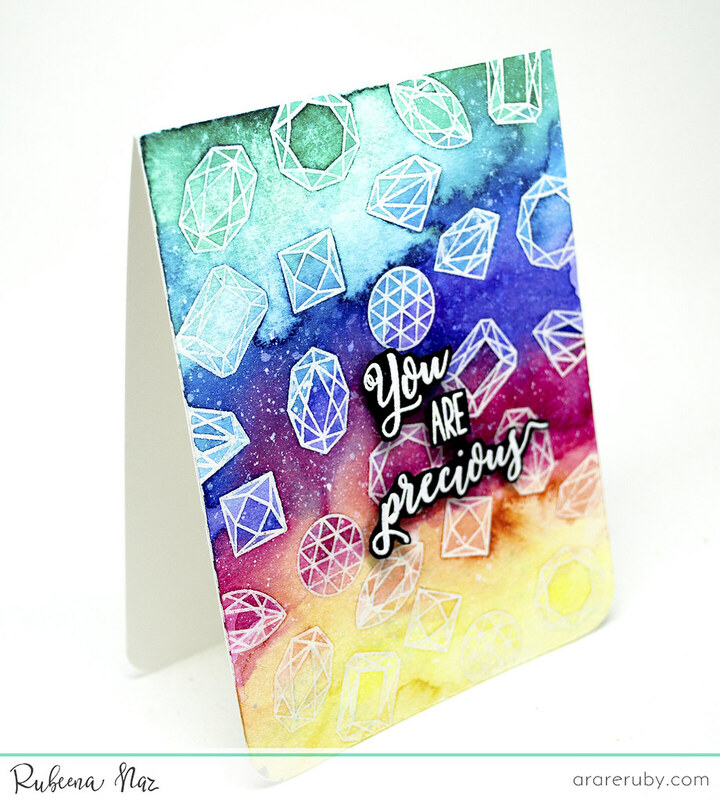 I stamped various gems with VersaMark ink on watercolor paper and heat set with white embossing powder. I created a rainbow of watercolors. Once it dried, I sprayed some white and shimmer sprays on it. 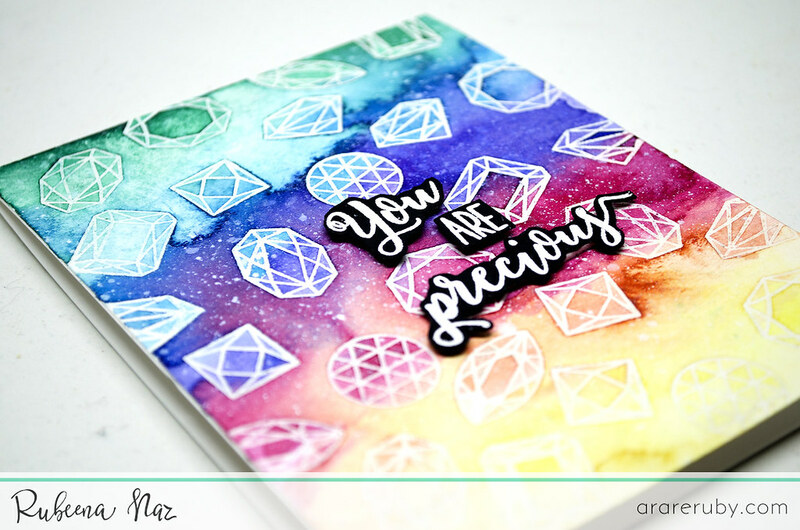 I stamped the words 'you' 'are' and 'precious from the same set on black card stock with VersaMark and heat set with white embossing powder. I fussy cut them and added them to the watercolor background with foam tape when it was dry. Thank you SO much for stopping by! 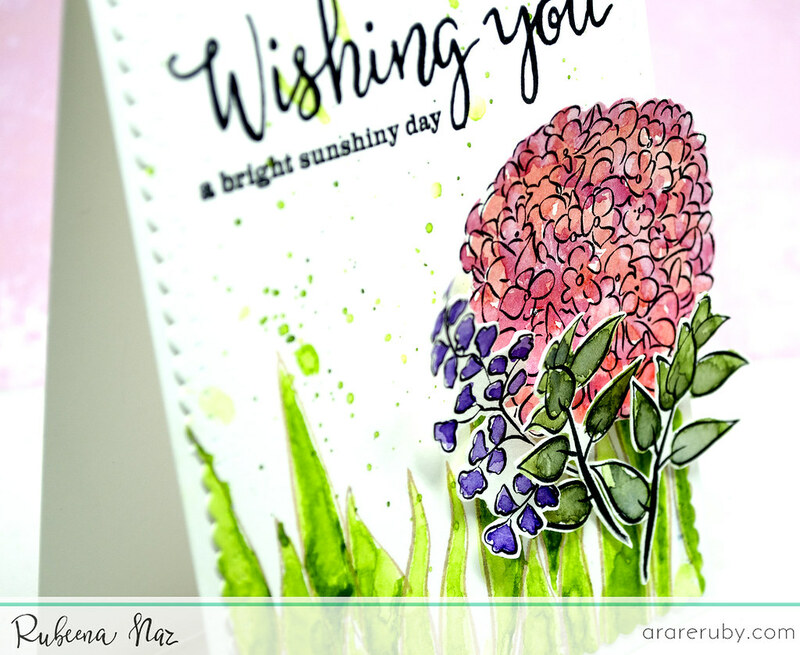 I hope today's projects inspire you to pull out your watercolors and create some cards! Fabulous eye candy!! LOVE all of these cards. beautiful...love all of Ruby's cards! in no time. Everything is at your fingertips. Rubeena has done W&W proud. All these cards are amazing. Ruby, your cards the last few days have been off the chain girlie! Yes, I am a big fan! I like the black background too. They're all so beautiful, I love, love all the water coloring. Thanks for sharing and inspiring. Wow, you were really in the zone!! Love them all but the card made with the My Precious stamp set is just absolutely gorgeous! These are so gorgeous but I agree with Linda, that last card is breath-taking!! Congrats on another fabulous post! 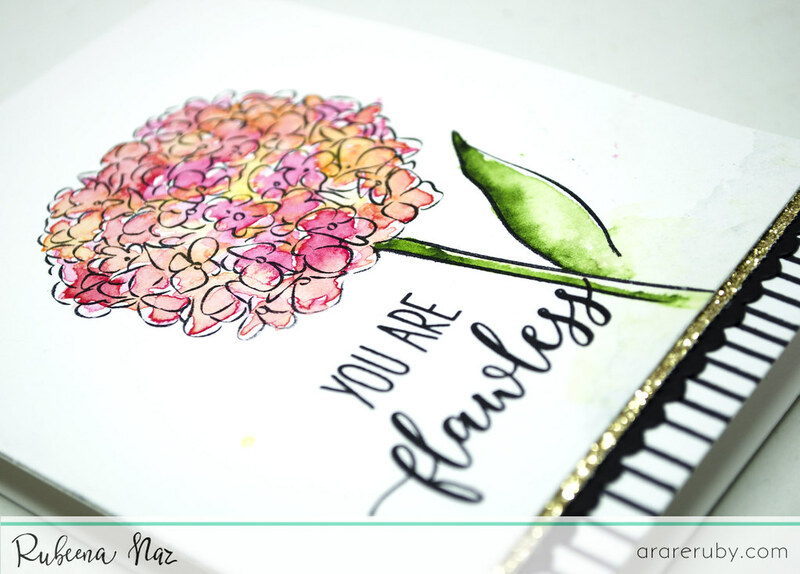 Rubeena's cards are gorgeous! The last card is really a show-stopper! Great colors! Wow! What a treat!! Awesome cards Rubeena!! Fabulous cards. Each is so different. Loved them !! Gorgeous cards, especially love the addies garden set. OMG - I don't even know where to begin. Every single card is just fabulous! Such beautiful cards! Each one is a work of art! These are just so spectacular. I already follow her blog and always love the way she uses color. What gorgeous cards! What a wonderful variety of cards. You are very talented. Oh my goodness Ruby! You have certainly been having fun! These are all gorgeous! Great work! So many beautiful cards! They are all fabulous, Ruby! All these cards are so pretty. Thank you so much for the inspiration. 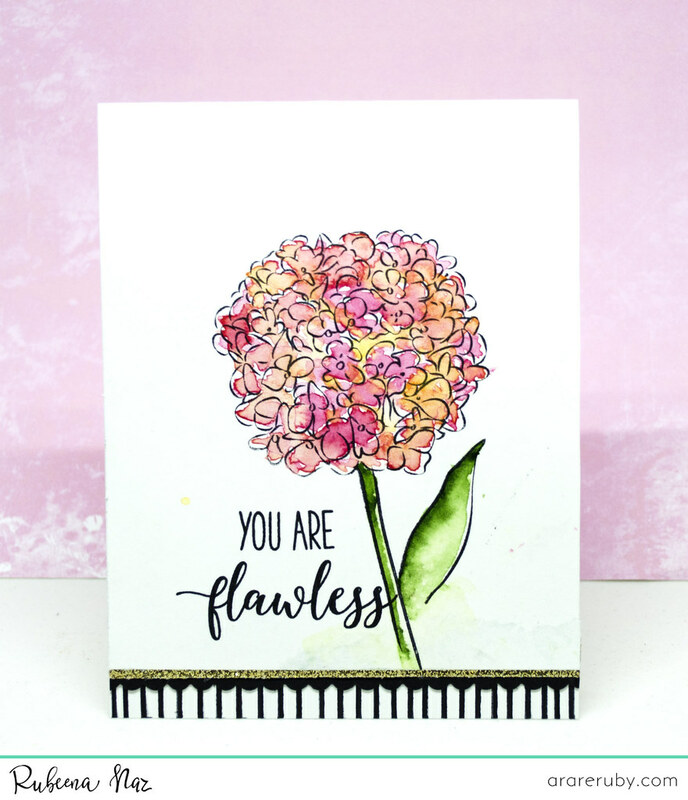 Beautiful floral cards, cute chickies and dazzling diamond card! Absolutely gorgeous cards! I can't begin to pick a favorite. I appreciated all of the detail you went into about the watercoloring. Lots of great tips and ideas! Thanks so much! Beautiful cards, Ruby!! 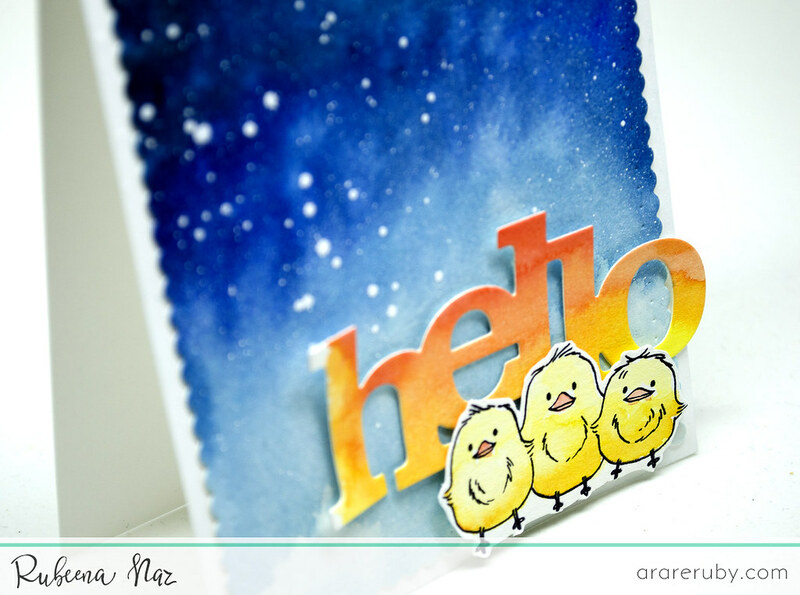 Your hello card w/ the chickies is stunning! Beautiful cards! Thanks for such wonderful inspiration. Wowzers! Wonderful creations Ruby, so inspiring! You have such a way with color and all of your cards are so beautiful! I love the one with the jewels and the cute chickie card! Yes, I am, BIG FAN! Beautiful work for sure! These are all so FABULOUS, WOW!!! Oooh, these are BEAUTIFUL!! Love! I can't believe you made all six of these cards in one day! You are amazing. So are your cards. Beautiful work. Beautiful cards. 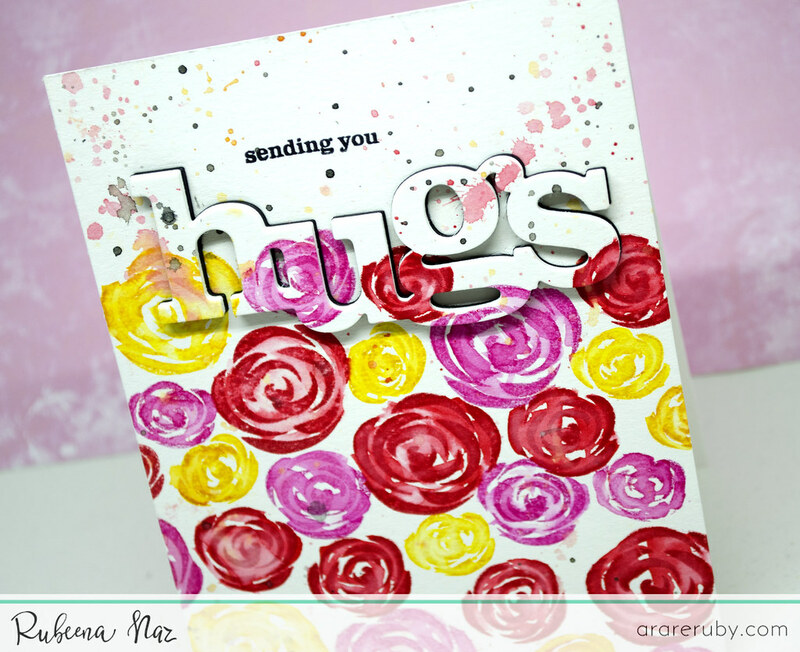 So pretty and love the "hugs" card and the gorgeous bright flowers. So pretty. All your cards are amazing.love the first flower. Just percect. Beautiful cards!! Love the flowers against black cardstock! Gorgeous, stunningly creative and original work by Rubeena!! Love it all!! WOW - you have worked MAGIC with the colours and designs!!! Wow your cards are gorgeous. Thanks for sharing your process ... you make it look possible for me to attempt!!!!!!! Great job and can't wait to see your next post. Amazing water colored cards! The first and last are breathtakingly beautiful and my favorites! I really like that black card with flowers in front! Nice! Hi Rubeena. Your cards are gorgeous. Especially the black one. I follow W&W by Facebook. Wow! These are just amazing! Love them all!